Frootloop is a Melee Fox main from Madison, Wisconsin who currently lives in the San Francisco Bay Area. 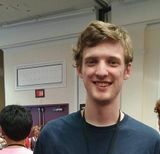 He is currently ranked 9th on the NorCal Melee Power Rankings and was formerly ranked 1st on the Wisconsin Melee Power Rankings. He has wins over Shroomed, SFAT, Laudandus, Azusa, Kels, Gravy, and HMW. He previously mained Falco and Sheik. This page was last edited on October 22, 2018, at 13:44.